Trying to get her finished up tonight. 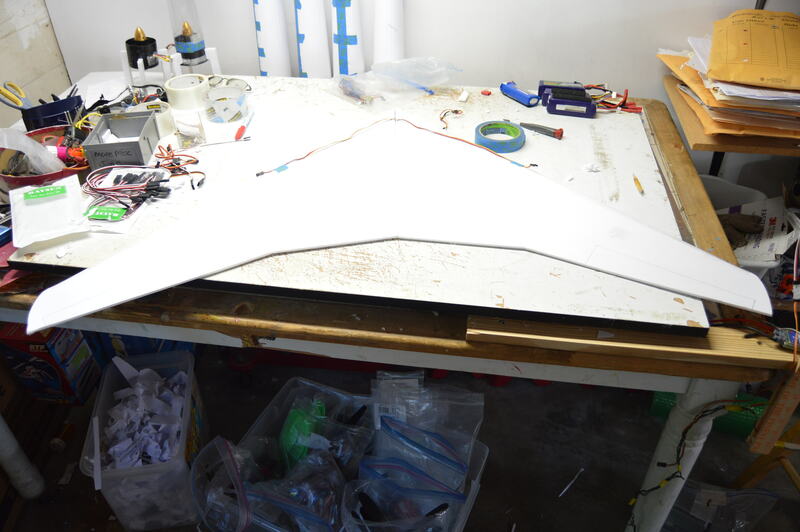 Built the wings - sorry, didn't take pics of the process but its basically the same as all my other wings (thin wing, single layer foamboard on the flat as a former, wood reinforcement trenched along the former - much the same as a nerdnic speed wing). 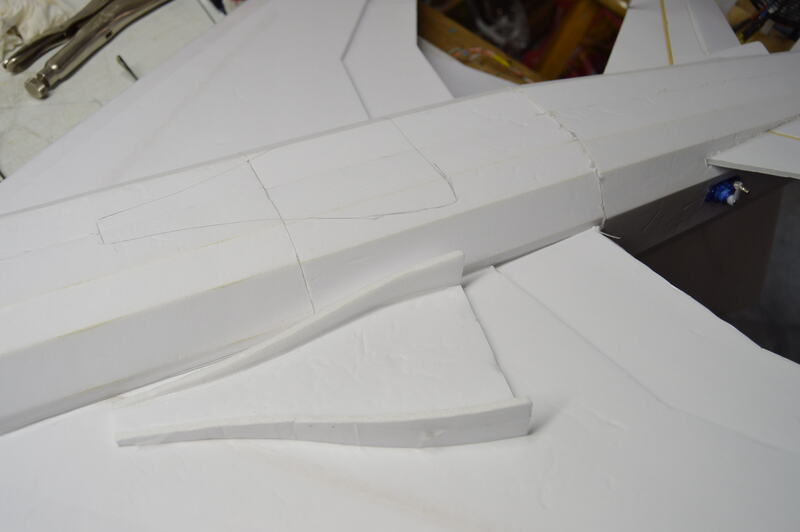 The wing cutouts didn't 100% match the wing profile (a common problem I have) and I had to lengthen the cutout on one side to get the wing to push through. 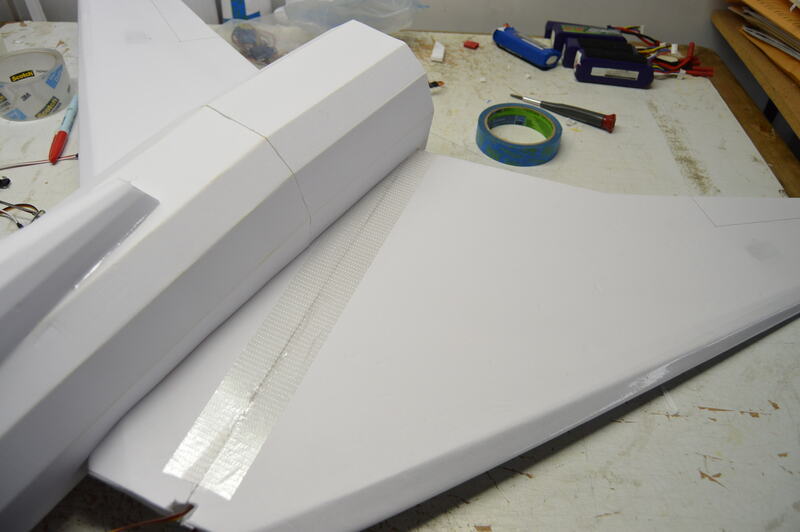 Placing the center seam of the wing join into this lengthened cutout gives the best chance to turn the wing into place. Installed the EDF. 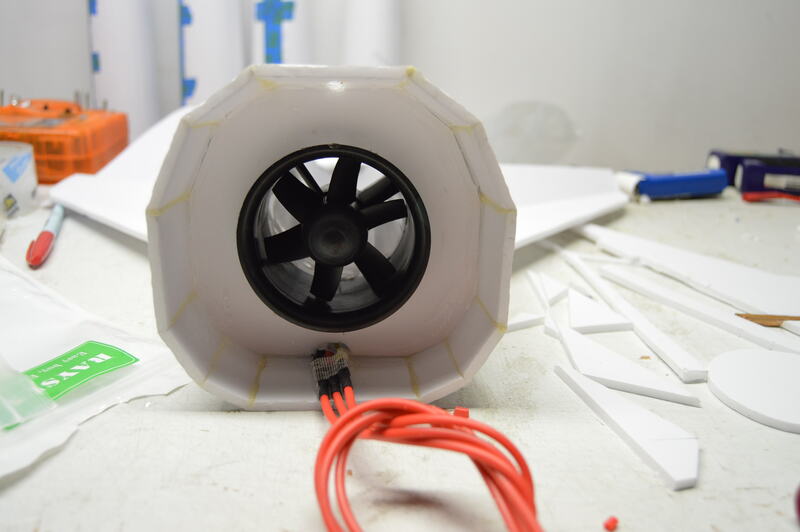 The thrust tube runs on top of the horizontal stabilizer which is a single piece that goes through the fuse. As I said earlier, when scaling the plane, I made it a little larger (40 inch span) so that the EDF and thrust tube would fit. Although I like the size she is right now, it could be scaled down 10 - 20% if I used @Sheriff 's approach and used a split HS - maybe next time. This would provide more thrust to weight. Cut a hatch taking the front section of the canopy with it. This was a mistake and poor planning on my part. I think I should mark up and cut the hatch first and then install the canopy without gluing the rear portion - this way it would lift with the hatch. Made up and installed a NACA duct. 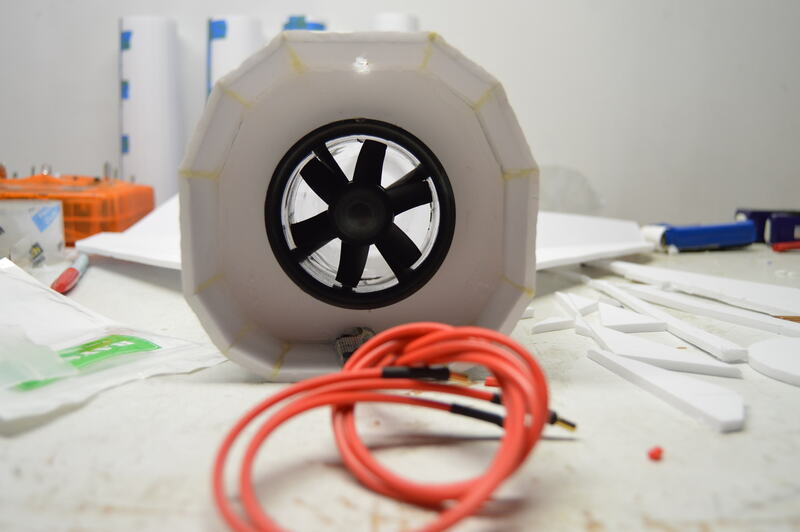 I tested this EDF on the thrust stand and could get approx 1200 grams with the 12 inch TT installed (note this was with 4 x 2200mAh 4S batteries in parallel and is therefore does not reflect what I would get on one battery which will be about 15% less - so about 1000 grams). Once installed in a closed fuse, this dropped to about 500 grams. 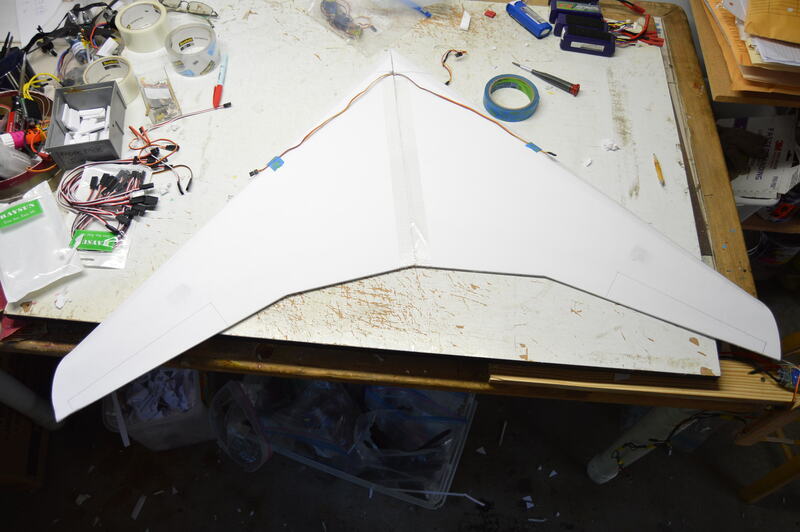 With the canopy off, it came back to approx 900 grams and with canopy on and NACA duct installed, it was about 850 grams. So still losing a lot and could probably do with more cheater holes. Anyway - will install the control horns and rods and some velcro to hold the batteries and we should be good to go for tomorrow morning. This is directly from the F-100 page on Wikipedia. "Particularly troubling was the yaw instability in certain regimes of flight which produced inertia coupling. The aircraft could develop a sudden yaw and roll which would happen too fast for the pilot to correct and would quickly over-stress the aircraft structure to disintegration. It was under these conditions that North American's chief test pilot, George Welch, was killed while dive testing an early-production F-100A (s/n 52-5764) on 12 October 1954. Another control problem stemmed from handling characteristics of the swept wing at high angles of attack. As the aircraft approached stall speeds, loss of lift on the tips of the wings caused a violent pitch up. This particular phenomenon (which could easily be fatal at low altitude where there was insufficient time to recover) became known as the "Sabre Dance"." I remembered reading this awhile back and pulled it back up. Hopefully these characteristics dont manifest themselves in the model but if they do this might provide some explanation. Good luck with the maiden! Hope your morning is a great and a smooth flight! After years of watching everyone else fly their large heavy foam (9 lbs+) F-100s I will note that the rudder has virtually no effect. How your super light aircraft will I don't know. Good luck, and bring her back in one piece. Looks great @DamoRC , seeing that wing reminded me i had cheated a little on mine as i was using a hot wire to cut. I did a straight line from the tip back to the root, no obvious flap area on mine. Cant wait to see yours in the air. After spending so much time looking at my plans i had an idea wondering if you could create a similar silhouette using 2 flitetest pre-designed wings. Like using the Spear as the main wings and a mini arrow for the tail feathers. @JTarmstr yeah i remember watching and reading about the Sabre dance when i was researching as well. If you look at the scale wing they have these wing "fences" (or something like that) to help deal with this issue. Having a hard time finding the info now, but i think they are the things on the top of the wings on this model here. Again its been almost a year since i read it so i could be wrong. Its always hard for me to watch those crashes, RIP that pilot. 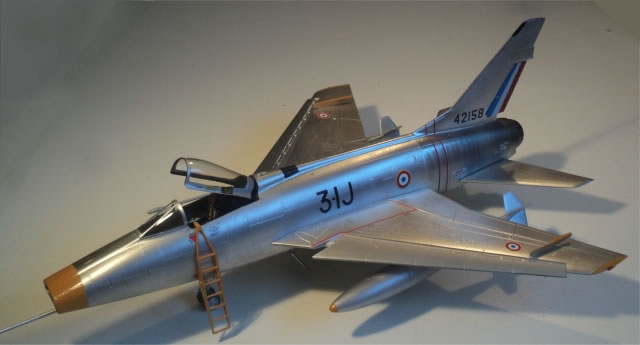 The sabre dance manifested itself mainly in the "A" models, the F-100D remedied many of the issues. There are detailed descriptions of the issue and its remedies HERE as I said I dont know if it will manifest itself in this model and even if it does I would assume you can power out of it. What made it so deadly with Super Sabre is that it was underpowered as you see in the crash. 10-15mph winds at Baylands this morning but having trashed the light jet, I decided to maiden her anyway (needed a win this morning). I think the 8.5 inch CG is probably right, I maidened her quite nose heavy and struggled a little to keep the nose up at launch but the rest was pretty easy. I didn't really test flying characteristics (stalls etc) bit she landed nicely into the wind, no drama. Tim took some chase footage so there should be a vid up in a few days. Good to hear that your F-100 made the day! Im still a little confused at your plan's dimensions (67in long and 40in wing span --ish) and what elf size I assume that you used a 70mm and not a 90mm? 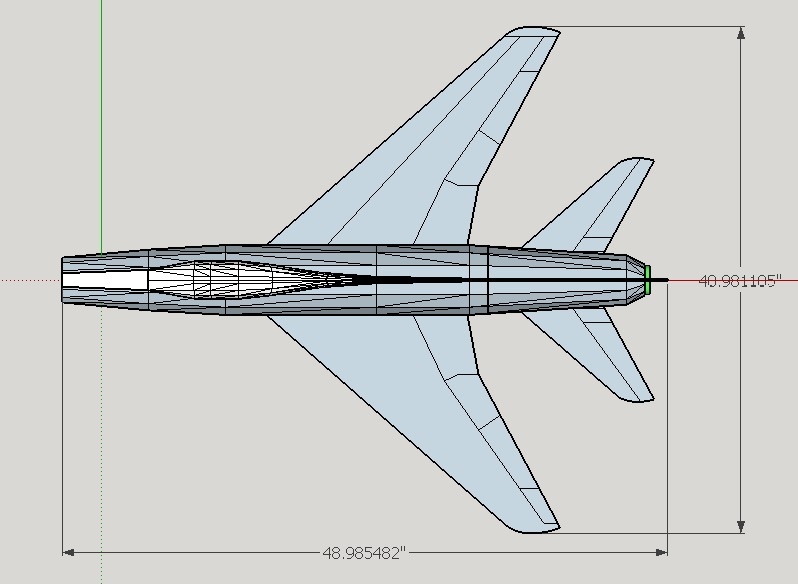 Here's a pic of the dimensions in Sketchup - basically 49" long, 41" wingspan. Yes - using a 70mm EDF. All up weight is a little over 2 pounds. Great job as usual D! Fantastic!!! Thanks for the clarification. 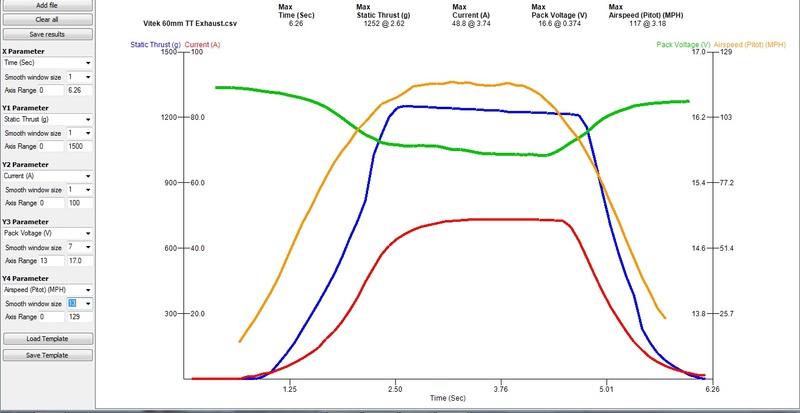 Once you get it dialed in you will have to give us your throws on ailerons and elevator. I will surely scan up to your dimensions for the 90mm. Really looks like my Fly Fly 100 in the air. I look forward to you posting your plans. They sure don't have to be better than what you have already built. I always wanted three F-100s 70mm 90mm X2. No probs. There's probably not a whole lot more dialing in to do. I just need to balance her correctly. Part of the reason why I maidened so nose heavy was that I couldn't get the battery weight back far enough. 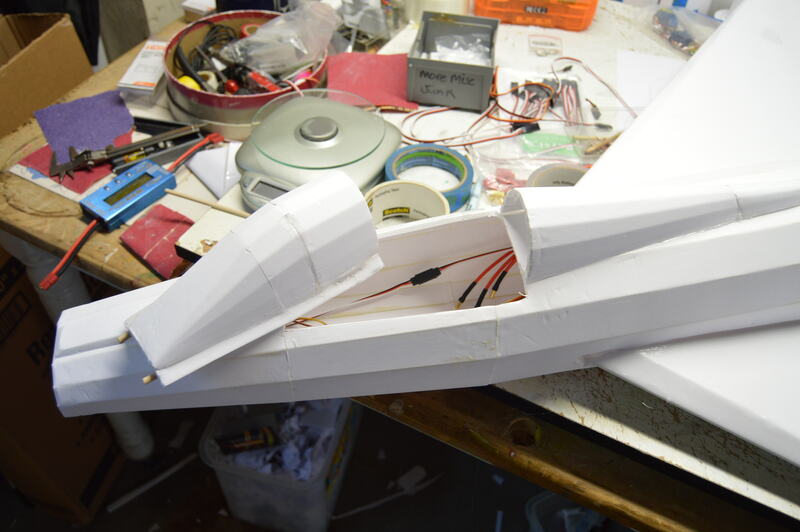 The EDF is so far forward in the tail (to avoid the hstab) that to balance her today I would have to add tail weight (and I hate adding dead weight) or slide the battery under the wing (and it kinda wouldn't go there because some idiot put a honking great NACA duct there). Given that pushing the EDF to the rear would help with thrust (shorter TT) and balance, I think the next iteration would have the EDF further back and split the Hstab. In this scenario, the model at the current scale could IMHO take the 90mm EDF without any problems (maybe a little hacking at the nose cone to get the thrust tube to exit). If you look at the landing, she wasn't floaty, but she definitely didn't need to come in hot, so I am pretty sure the wings would carry the 90mm power setup and I am seriously considering scaling her down a tad for the 70mm. 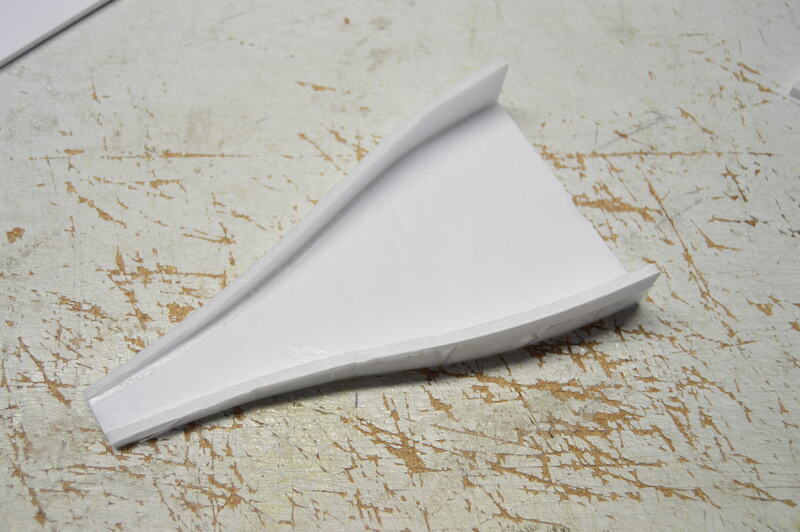 Then I need to sort the wing and cutout. The wing folding at the root could be a lot better. Wing flew fine (although I didn't check for stalls) but from a construction point of view it could be better (too thin at the root). 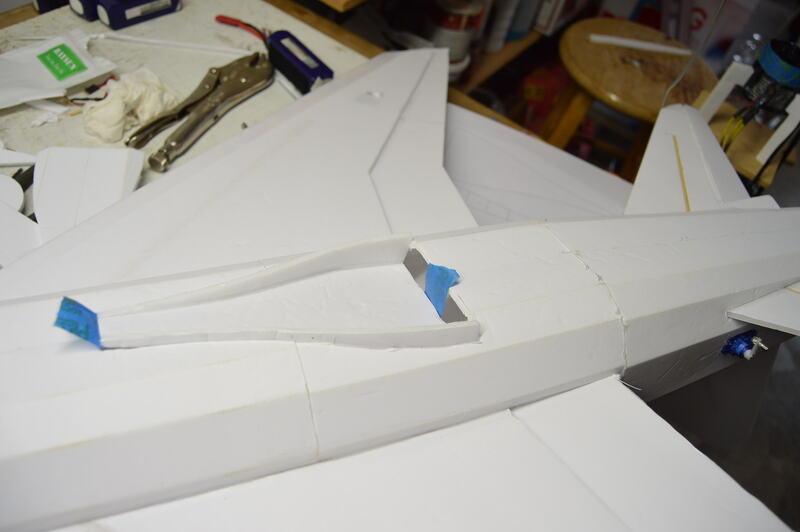 Last thing to fix would be enough inlet air for the EDF which I think can be achieved with a bigger NACA duct and removing material from the trailing edge of the wing inside the fuse. Anyway, I think I'll keep flying her as is until V2 is ready. I can post Rev 1 plans if folks would like them. Awesome to hear! I'm looking forward to your final revisions! And that F-100 is sweet looking! holy crap that’s cool, nice work sir! Fences keep airflow over the control surfaces at higher angles of attack. These are needed on the supercritical airfoil of the real f-100. on our models they may or may not help but if you get into issues with the "Saber Dance" they would likely help some. Shouldn't take me long to modify the tail section to take a 90mm by splitting the hstab. Only issue I am not 100% sure about is how to get enough air in there for a 90mm. F106 fuse should be simpler - there's a really nice example by @F106DeltaDart here where you can see the cross section shape clearly.